A lot of things have changed since 1996. Kobe Bryant, now retired with five championships, was still a fresh-faced rookie back then. Everyone wanted to get their hands on a Nintendo 64 though it could only handle games with a maximum memory of 64MB. People are doing the Running Man and Trumpets Challenge now but back then it was the Macarena that had everyone looking silly. (Buti na lang wala pang camera phone noon.) We didn't have JaDine but we had Bobby Andrews and Angelu De Leon. Marami ka pang pimples nu'n tsaka ginagaya mo yung buhok ni Wowie de Guzman. (Buti na lang talaga wala pang camera phone noon.) Tamagotchi was a thing. Seinfeld and Friends were still on TV, and the biggest movie was Independence Day. 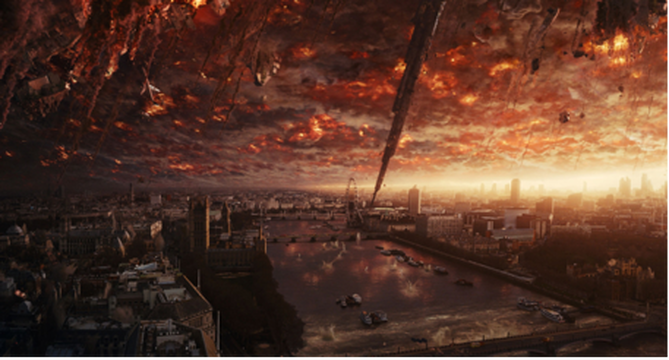 And now 20 years later, there's a sequel coming out called Independence Day: Resurgence. But is it actually worth the wait? Is this a story worth coming back to? 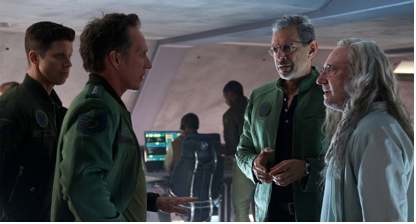 Independence Day: Resurgence is set exactly 20 years after the events of the first movie. We've always asked the question of whether we were all alone in the universe. In 1996, we finally got our answer but not in the form that we wanted. Aliens invaded and almost destroyed all human life on Earth. With the fate of mankind at stake, the words “Independence Day” took on a new meaning. It was no longer an American holiday but instead would commemorate the day that humanity fought back to save the planet. The survivors now live in peace and have enjoyed unprecedented advancements in technology. There has not been a major conflict between nations and the world is governed by a council of world leaders. Visibly absent though is the Philippines which is so unfair. Naturingan pang Miss Universe si Pia Wurtzbach kung hindi man lang tayo kasama diyan! So basically this would be what John Lennon was singing about when he wrote the song "Imagine" if only he added a line or two about aliens invading. Thor's baby brother is in the movie as pilot Jake Morrison. Everyone from the first movie is back and the first half hour of the movie is spent updating us about the lives of these characters. Well, everyone except Will Smith, who allegedly asked for $50 million to play Capt. Steven Hiller again, the role that made him an international superstar. (Di ka na ma-reach Pareng Will!) 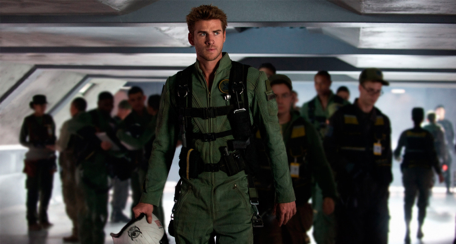 Taking his place as the cocky pilot is Jake Morrison (Liam Hemsworth), who along with Hiller's son (Jessie Usher) and Rain Lao (Angelababy) make up a team of pilots tasked with protecting the Earth. Some of you probably weren't even born yet when Independence Day first came out. But for those of who were old enough to watch in cinemas, it was groundbreaking. Don't get me wrong, it wasn't an award-winning movie. In fact, if you watched it today, it would be laughably outdated. However, it was the first movie to do destruction in such a large scale. Now you're probably thinking, "Eh ano naman? Lahat naman ginagawa na 'yan ngayon eh." Well that's exactly the point. The movie, directed by Ronald Emmerich and produced by half-Filipino Dean Devlin, was one of the first movies to show landmarks and cities being decimated. 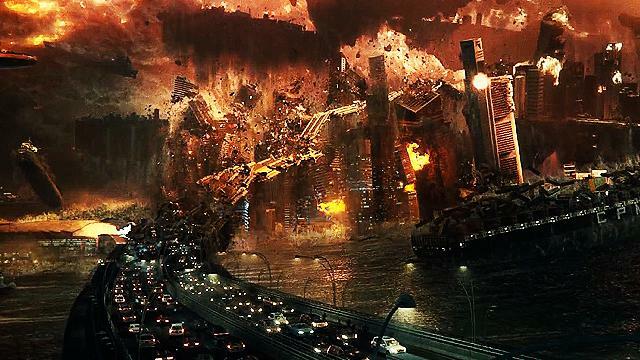 The Avengers, Batman v. Superman, and all the other superhero movies that never seem to run out of cities to destroy can consider Independence Day to be their granddaddy. Let's be honest, we're going to watch this movie for the nostalgia and because we want to see how they're going to destroy the Earth this time. 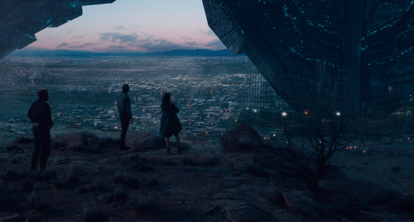 We've seen a lot of sci-fi movies in the last 20 years and Independence Day: Resurgence had to do something we've never seen before in order to impress us. The set pieces in this movie were amazing and to see them blow up in ways we've never seen before was even more amazing. It's a spectacle to behold. Sure, the plot was every bit the same as the one 20 years ago: aliens attack, everything explodes, humans find a way to defeat aliens, humans eventually defeat aliens. (Spoiler ba? C'mon you can't tell me you didn't expect that, right?) But hey, there's nothing wrong with sticking to a working formula. Even Star Wars: The Force Awakens did that. ID: Resurgence wasn't out to make a different movie, it was out to make the same movie but bigger and using the advancements in CGI. As a sci-fi movie, it doesn't intend to outsmart movies such as Gravity or Interstellar. It just aims to entertain audiences. It doesn't take itself too seriously and we the audience are expected to just take it as it is. Although I think it would have benefited the movie if they capitalized on the emotional scenes more. Lingering for a few more seconds when a character dies and actually showing us that their families and friends are affected would have helped us feel the seriousness of the situation even more. It's fun to see things blow up, but it would have been better if the movie made us feel that what just happened is of importance (half the population of the world dies AGAIN so it's definitely important) and not just bricks and mortar that you can easily rebuild. But it's hard to build on an emotion when there's a lot of characters involved and a lot of stories to tell. And clocking in at exactly two hours, the movie makes good use of every minute. The story flows at a steady pace that it's never boring despite the length. If you didn't like the formula of the first movie, there's a chance that you might like this one. But for most audiences, I think you'll come out of cinemas with that feeling that you've just been on a ride in a theme park. You had fun. 7.5/10. The movie aims to entertain and it does. Although the charisma of an actor like Will Smith is missed, it ultimately doesn't matter because in a movie like Independence Day: Resurgence, what matters is the spectacle that you paid to see onscreen.